In order to MAKE time when there's no time to be found, writing across the curriculum means incorporating writing instruction into science time. With Common Core putting more pressure on us than ever to focus on math, reading and writing, it can feel like a constant struggle to "fit in science and social studies" at the elementary level. 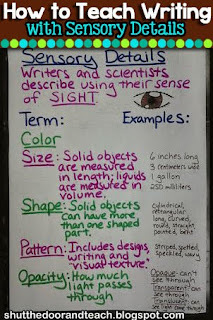 One of the best matches I've found is to marry the idea of teaching the five senses observations as content area objectives while practicing writing using sensory details. This mini unit works really well at the beginning of the school year, when the kids are naturally curious about observing their new learning environment. After a quick review of our content area objectives (defining the 5 senses) I split them up into teams to scope out defined areas of the room. Armed with clipboards, they are ready to record as many observations as they can in 3 minute chunks of time. Once they have a wide collection, I have them narrow down their list to 3 objects to make sure they described them using 3 senses (inevitably their first list features nothing but sight, in spite of the review). We play a little guessing game to see how detailed their descriptions are, and then the real content area vocabulary lesson begins. From the three students choose a single object to focus on. 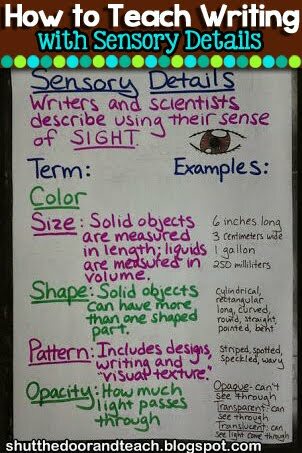 For our sense of sight and touch I spend time going over domain specific vocabulary; something emphasized in common core writing. While most kids focus on the color of objects (something we'll return to later in the year for figurative language) opacity is a new concept. They tend to forget to mention size as well, so with the explicit instruction this concept can be differentiated. Some students are ready to go grab a ruler and find a precise length of their object. Others need to use comparative statements before they are ready to apply what they know about length, width or height find the measurements of their object. These comparisons help students understand the science content while practicing writing across the curriculum. The quality of their writing improves with explicit instruction of science vocabulary. The end result of this data collection process is a multi-paragraph informational piece of writing, which is great for common core, as well an understanding of how to conduct scientific observations in order to explore the world around them. 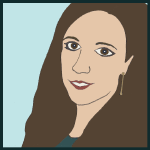 What's your favorite way to foster Writing Across the Curriculum and integrate writing into other content areas?